This isn't the type of book I normally read or listen to. I ended up mostly listening to this in audible format and I generally liked it. This is a fairy story. It's about a girl who goes to fairy land. I guess I haven't really read a fairytale or fairy story since I was a kid. It's a little bit all over the place with the random stuff that happens but at the same time it's full of interesting ideas and sets an interesting scene. It probably helps that the author is also the narrator since she can read the book with the inflection she intended when writing it. It's kind of a weird one but it's good. 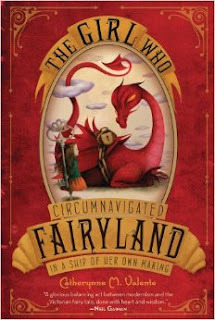 I liked my time with The Girl Who Circumnavigated Fairyland.